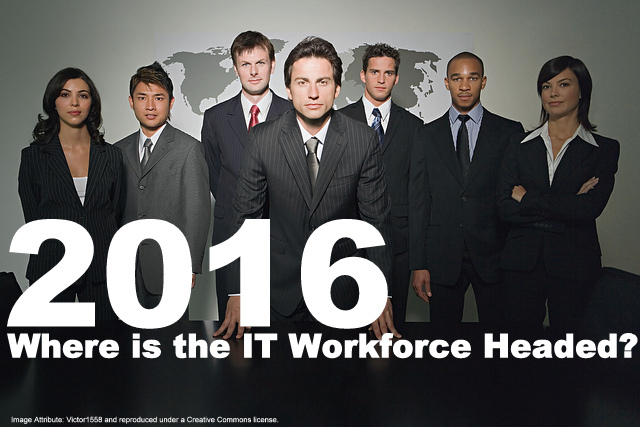 2016, Where is the IT Workforce Headed? Image Attribute: Victor1558 and reproduced under a Creative Commons license. Needless to say, technology has taken center stage and would continue to do so, the point is how fast we would be at picking up the latest trends and implementing them successfully. The Global IT market is assumed to have crossed $ 3.8 trillion in 2016. Statistics on Business Confidence Index for the IT industry showed an elevated figure through most of this year with very slight fluctuations. This goes on to affirm the fact that there is a continuous need for IT professionals, thereby contributing to positive IT labor growth. They include core technical positions – software developers, support experts, network specialists, testing and QA experts etc. They also consist of non-technical professionals like the HR, sales, and marketing, finance, etc. which are an integral part of the proper functioning of an IT company. Typically, these companies employ technical professionals for positions like software development, technical support – software and hardware, network engineer, etc. These companies could be from across various industry verticals such as banking and financing, manufacturing, FMCG, healthcare, etc. Besides these technical occupations, there is a set of technology intense positions as well. Cloud computing is a major driving force of the IT economy with cloud bandwidth and computing power already being commoditized. The cloud has directly and indirectly given rise to various other trends such as real-time analytics, improvement in security models, industries have revamped their software and hardware requirements to improve returns, etc. This trend has transformed technology strategies as well as IT operations. IT services today focus on providing clients with greater flexibility, security, and accessibility empowering businesses spread across various geographies through cloud technology. The speculation about security issues with regards to cloud computing has also been addressed thereby encouraging even government agencies to adopt a cloud-first approach. The IT workforce today is well equipped to provide cloud services such as migration to cloud, Infrastructure as a Service (wherein data centers are managed to provide vital information to a global workforce. ), Platform as a Service (legacy platforms empowered with a cloud-first approach), Software as a Service for better flexibility and scalability of hosting services. Enterprise Mobility Solution to empower employees and businesses with critical information across various devices. Data analytics and the benefit of data-based decisions have become popular, leading businesses to restructure their activities. It is clearly evident that data-driven decisions give businesses the competitive advantage that separates them from their peers. The present day IT services, focus on helping businesses adopt data management practices, provide latest tools for data storage and analytics. Again, data abstraction supported by cloud services have been able to deliver critical analytical solutions that directly impact the business. IT workforce has to be fortified with the latest data management services that give useful insights on business, function, and service of the particular organization. IT services focus on providing end-to-end data solutions that emphasize on a comprehensive approach. A recent survey by Business Insider shows that there would be over 34 billion devices connected to the internet by 2020. Also a whopping $6 trillion is expected to be spent on IoT solutions over the next 5 years. Businesses and governments are expected to invest heavily in this sector and the IT industry should arm itself to cater to this huge demand for connecting devices to fulfill various LoB requirements. The IT workforce would have to gear-up to create smart systems that can communicate with each other to accomplish a goal. They would have to cater to IoT services directed at customers, businesses, security applications, device management and analysis, processors, operating systems, etc. A full stack developer is expected to have a fair idea of these layers, thereby making it easier to collaborate and work on a project in a successful manner. 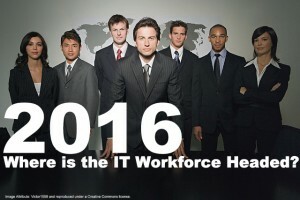 As the technology landscape keeps changing the global workforce is expected to reshape itself. Since businesses prepare for long-term goals, there is a huge need for technological skills. In Jill Goldstein’s (HR lead, Accenture)words – It is going to be increasingly challenging to hire these specialized individuals as most of them prefer to work independently, on a third-party basis. She goes on to say that the future workforce would constitute of a large percentage of non-salaried employees who are highly skilled. And very often this workforce has an expertise in new technology trends that grant organizations the competitive edge they require to stay ahead of the game. As a result, companies now transfer the responsibilities of the temporary worker from procurement to HR. This is a huge change from how things used to be. The interests of these highly skilled talented workers are safeguarded to ensure a continued relationship that is mutually beneficial. Boomerang employees are those that leave the company to return at a later point in time. Though there are some companies that have a policy against hiring boomerang employees, there are a greater number of companies who prefer them over fresh candidates. The reason being that these employees are well adjusted to the culture and require minimal training to resume work; but come with a fresh perspective. This trend can be attributed to the fact that professionals switch jobs more often there is improved access to talent through technology. In fact, several organizations actively maintain networking groups like Facebook and LinkedIn to stay connected with former employees. Another major change is the perception of promotion. These days, employees prefer taking up horizontal transfers. This works out to be beneficial for both the employee and the company. From a company perspective, it improves productivity and communication as such employees would have a good understanding of how the various departments function and hence are better at getting things done. From an employee’s point of view, it definitely enhances the resume and eventually prepares the candidate for a successful vertical movement. The ever-changing markets and constantly evolving technology landscape have been instrumental in bringing about all of these changes in the way we work and conduct our businesses. As Kurzweil puts it we can expect to see mammoth changes in technology and the way it impacts our life in the coming years.